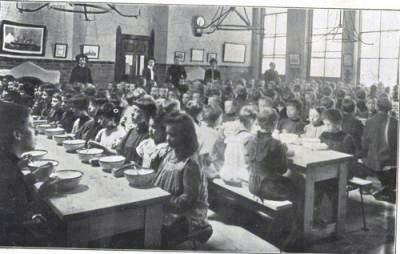 Schools are very evocative of our personal and family histories. My family have been teachers for many generations, so I like seeing where they taught as well as where they studied. Some people give directions by pubs, we do it by schools! This website is devoted to Liverpool’s Schools and Teachers. Having some difficulty with formatting on some pages - contact me if you need information, while I work on it! Thanks everyone who has contributed, including all the staff at Liverpool Record Office. Please note that I don’t have access to school records. Everything on this site has been collected from the Liverpool Record Office, or given to me by kind contributers. I cannot locate children as there is no central record! Use the site map to see what is where on the site. I am building up lists of schools and teachers from Liverpool Directories and census returns. Some are only partially indexed, but I thought they were worth including - you never know, someone may be interested. They will grow, I promise! Please check back. School pages: Aigburth Vale; Alderwood; All Hallows; All Saints RC; Anfield Rd; Arnot St; Aspen Grove; Banks Rd; Barlows Lane; Beaufort St; Birchfield; Blackburne House; Blessed Sacrament; Bluecoat; Boaler St; Booker Avenue, Brae St; Broadgreen; Calderstones; Campion; Cardinal Godfrey; Cardinal Heenan; Chatsworth; Christchurch, Christ the King, Clint Rd, Colwell, Croxteth; Daisy St; Dog & Gun; Dovedale; Ellergreen, Everton Valley; Florence Melly; Fonthill Rd, Garston CE: Gateacre; Gilmour, Girton House, Gwladys St; Harrington; Harrison Jones; Hebrew Schools; Hey Green; Hope St; Hunts Cross; King David; La Sagesse; Leyfield; Linacre; Liverpool Collegiate; Monksdown, Mosspits, Much Woolton RC, Our Lady of Good Help; Our Lady of the Assumption; Pinehurst; Pleasant St; Queen Mary; Roberts Rd; Roscoe; Seamen’s Orphanage; St Anne’s; St Augustine’s; St Austin’s; St Bonaventure’s; St Bridget’s; St Christopher’s; St Clement’s; St Cuthbert’s; St Edmund’s; St Francis of Assisi; St Francis Xavier; St Hilda’s; St John’s; St Kevin’s; St Lawrence; St Nicholas; St Oswald’s; St Peter’s, Woolton; St Philomena’s; St Swithin’s; St Teresa’s; Stocktonwood; Sudley; West Derby; Whitefield, Windsor St and Woolton. I am always looking for more information about other schools - have a look at the school pages, and contact me if you have anything you would like to share. For information on teachers who worked in Liverpool, from the 1760s on, see the Teachers’ Page. This will take you to information from directories, census and other sources including Teacher Registrations. Take a look at the page on the 1861 census. 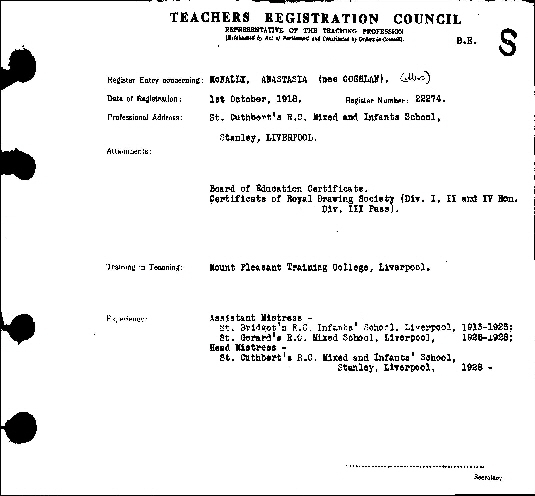 This page gives some analysis of the teaching force in Liverpool at the time.